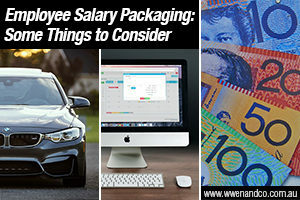 Salary packaging is a tactic for an organisation to increase the take-home pay of its employees — and if done correctly, at no extra cost to the business but with a tax advantage to the employee. Basically, an employee agrees with their employer to forego part of their future salary or wages in return for the employer providing benefits of a similar value. By paying for items out of pre-tax salary employees can reduce taxable income. Benefits typically provided include cars by way of novated lease, provision of property (such as a computer) or payment or reimbursement of expenses. For employers, salary packaging has some advantages, such as the ability to attract employees, and it may also act as an incentive to reward employees. Benefits that employees can package can be dependent on the type of organisation as well as the items that employers are willing to package. There can however, be additional administration costs to employers in making sure that these arrangements are processed correctly. The ATO says employers need to be very aware of fringe benefits tax (FBT) when working out what can be provided to replace the income in a typical salary sacrifice arrangement. Sometimes it can cost employers more in remuneration if salary packaging is done incorrectly because of .B.T. being levied. expense payments (such as loan repayments, school fees, child care costs and home internet connection). For example, if an employee salary packages golf club membership worth $2,000 (including GST), the amount sacrificed from their salary will generally be that amount plus any FBT liability. Including a car in a salary package is very popular, and doing so as part of a salary sacrifice arrangement will often raise the topic of “novated leases”. Salary sacrificed super contributions are treated as employer contributions, and if made to a “complying super fund” the sacrificed amount is not considered a fringe benefit for tax purposes, which means that employers will not be liable to pay FBT on the super contributions. Further, these will not be included as a reportable fringe benefit amount on the employee’s payment summary. However salary sacrificed super contributions in excess of mandated contribution caps must be reported on the employee’s payment summary as reportable employer super contributions. Note however that salary sacrificed super contributions made to a non-complying super fund will be a fringe benefit. Certain fringe benefits are specifically exempt from FBT. Note that the exemption applies if the items are primarily for work-related use. Alternatively, there is an “otherwise deductible” rule, which works by allowing an employer to avoid an FBT liability on an item to the extent that if the employee would have been eligible to claim the item as a deduction in their own tax return had they bought this item themselves. Specifically, there will be no FBT on the item purchased if an employee uses it solely for work purposes. There may be some apportionment, and therefore an FBT liability, if it is not fully being used for work purposes.